The Dark Horse is a bar and kitchen with an upstairs venue for gigs and club nights. 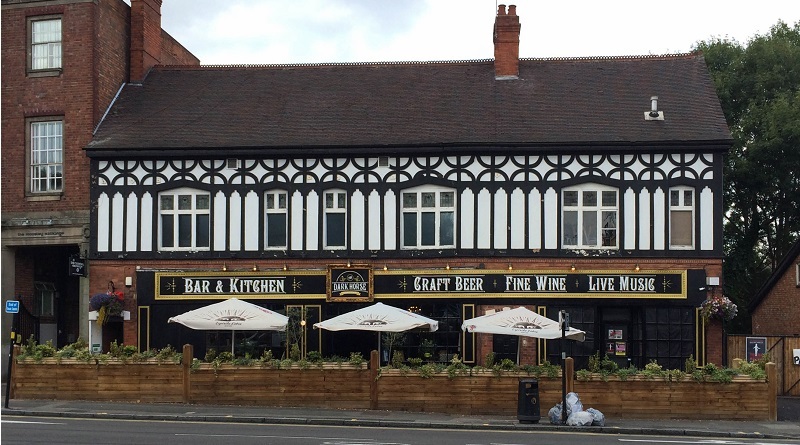 It is located near the centre of Moseley’s vibrant high street. The venue has been through many changes in recent years, formerly being a pub called The Cross and then a pizza restaurant called “Mo’ Dough”. It now regularly hosts gigs for local bands, eclectic club nights featuring soul, funk and disco, and the regular “Cheeky Monkey Comedy Presents” night. The Dark Horse has two bars- one on each floor- with a wide array of alcoholic drinks, particularly craft beers. Food is served downstairs, with a menu particularly focused on handmade burgers and BBQ meat. The venue portion of the pub is located upstairs and as such there is no wheelchair access available. There is also no cloakroom. Find out what’s coming up at The Dark Horse via darkhorsemoseley.co.uk. The Dark Horse is located on the A345, Alcester Road. As it is near the centre of Moseley high street, signs towards Moseley can be followed. There is a car park opposite the pub which is free after 6pm. There are unfortunately no train stations near Moseley; the nearest, Bournville, is almost an hour’s walk or a ten minute drive away. However, The Dark Horse is located near the 50, 35 and 1 bus stops, which go from various parts of the city centre to more suburban areas of Birmingham such as Kings Heath and Kings Norton. For more information on public transport in the West Midlands, please visit networkwestmidlands.com.